Want some tips on being more productive in your business? You’ll want to check out the latest ebook from Evernote Productivity Ambassador, Joshua Zerkel. The ebook Evernote @ Work, The Ultimate Guide to Implementing Evernote in Your Business has a number of tips on using Evernote to be more efficient. 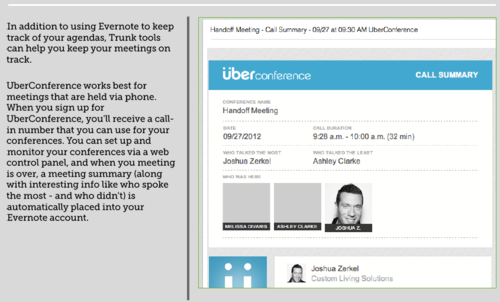 ÜberConference is one of the Evernote integrations mentioned in the book, and is highlighted as a tip for keeping your meetings on track. ÜberConference’s integrationstarted as a way to automatically saves call summaries in Evernote, and last week added a new feature for sharing Evernote notes in meetings.